For other uses, see Santa Maria Maggiore (disambiguation). The Basilica di Santa Maria Maggiore (Italian pronunciation: [ˈsanta maˈriːa madˈdʒoːre]; Basilica of Saint Mary Major, Latin: Basilica Sanctae Mariae Maioris), or church of Santa Maria Maggiore, is a Papal major basilica and the largest Catholic Marian church in Rome, Italy. The basilica enshrines the venerated image of Salus Populi Romani, depicting the Blessed Virgin Mary as the help and protectress of the Roman people, which was granted a Canonical coronation by Pope Gregory XVI on 15 August 1838 accompanied by his Papal bull Cælestis Regina. Pursuant to the Lateran Treaty of 1929 between the Holy See and Italy, the Basilica is within Italian territory and not the territory of the Vatican City State. However, the Holy See fully owns the Basilica, and Italy is legally obligated to recognize its full ownership thereof and to concede to it "the immunity granted by International Law to the headquarters of the diplomatic agents of foreign States." The Basilica is sometimes referred to as Our Lady of the Snows, a name given to it in the Roman Missal from 1568 to 1969 in connection with the liturgical feast of the anniversary of its dedication on 5 August, a feast that was then denominated Dedicatio Sanctae Mariae ad Nives (Dedication of Saint Mary of the Snows). This name for the basilica had become popular in the 14th century in connection with a legend that the 1911 Catholic Encyclopedia reports thus: "During the pontificate of Liberius, the Roman patrician John and his wife, who were without heirs, made a vow to donate their possessions to the Virgin Mary. They prayed that she might make known to them how they were to dispose of their property in her honour. On 5 August, at the height of the Roman summer, snow fell during the night on the summit of the Esquiline Hill. In obedience to a vision of the Virgin Mary which they had the same night, the couple built a basilica in honour of Mary on the very spot which was covered with snow. From the fact that no mention whatever is made of this alleged miracle until a few hundred years later, not even by Sixtus III in his eight-line dedicatory inscription ... it would seem that the legend has no historical basis." The Blessed Virgin Mary overlooking Pope Liberius as the Pontiff scrapes the foundation of the basilica into the snow. By Italian artist Masolino da Panicale. circa 15th-century. Museo di Capodimonte. The feast was originally called Dedicatio Sanctae Mariae (Dedication of Saint Mary's), and was celebrated only in Rome until inserted for the first time into the General Roman Calendar, with ad Nives added to its name, in 1568. A congregation appointed by Pope Benedict XIV in 1741 proposed that the reading of the legend be struck from the Office and that the feast be given its original name. No action was taken on the proposal until 1969, when the reading of the legend was removed and the feast was called In dedicatione Basilicae S. Mariae (Dedication of the Basilica of Saint Mary). The legend is still commemorated by dropping white rose petals from the dome during the celebration of the Mass and Second Vespers of the feast. The earliest building on the site was the Liberian Basilica or Santa Maria Liberiana, after Pope Liberius (352–366). This name may have originated from the same legend, which recounts that, like John and his wife, Pope Liberius was told in a dream of the forthcoming summer snowfall, went in procession to where it did occur and there marked out the area on which the church was to be built. Liberiana is still included in some versions of the basilica's formal name, and "Liberian Basilica" may be used as a contemporary as well as historical name. On the other hand, the name "Liberian Basilica" may be independent of the legend, since, according to Pius Parsch, Pope Liberius transformed a palace of the Sicinini family into a church, which was for that reason called the Sicinini Basilica. This building was then replaced under Pope Sixtus III (432–440) by the present structure dedicated to Mary. However, some sources say that the adaptation as a church of a pre-existing building on the site of the present basilica was done in the 420s under Pope Celestine I, the immediate predecessor of Sixtus III. Long before the earliest traces of the story of the miraculous snow, the church now known as Saint Mary Major was called Saint Mary of the Crib (Sancta Maria ad Praesepe), a name it was given because of its relic of the crib or manger of the Nativity of Jesus Christ, four boards of sycamore wood believed to have been brought to the church, together with a fifth, in the time of Pope Theodore I (640–649). This name appears in the Tridentine editions of the Roman Missal as the place for the pope's Mass (the station Mass) on Christmas Night, while the name "Mary Major" appears for the church of the station Mass on Christmas Day. Map by Giacomo Lauro and Antonio Tempesta depicting Saint Mary Major among the Seven Pilgrim Churches of Rome in 1599, in view of the Holy Year of 1600. No Catholic church can be honoured with the title of "basilica" unless by apostolic grant or from immemorial custom. St. Mary Major is one of the only four that hold the title of "major basilica". The other three are the Basilicas of St. John in the Lateran, St. Peter's, and St. Paul outside the Walls. (The title of major basilica was once used more widely, being attached, for instance, to the Basilica of St. Mary of the Angels in Assisi.) Along with all of the other four Major Basilicas, St. Mary Major is also styled a "Papal basilica". Before 2006, the four Papal Major Basilicas, together with the Basilica of St. Lawrence outside the Walls were referred to as the "patriarchal basilicas" of Rome,[Notes 2] and were associated with the five ancient patriarchates (see Pentarchy). St. Mary Major was associated with the Patriarchate of Antioch. The five Papal Basilicas along with the Basilica of the Holy Cross in Jerusalem (actually in Rome) and San Sebastiano fuori le mura were the traditional Seven Pilgrim Churches of Rome, which were visited by pilgrims during their pilgrimage to Rome following a 20 kilometres (12 mi) itinerary established by St. Philip Neri on 25 February 1552. On 21 June 2011, Pope Benedict XVI issued a Papal bull granting equal indulgences of the basilica for pilgrims who travel to the Minor Basilica of Our Lady of Manaoag. It is now agreed that the present church was built under Celestine I (422–432) not under Pope Sixtus III (432–440), who consecrated the basilica on the 5th of August 434 to the Virgin Mary. The dedicatory inscription on the triumphal arch, Sixtus Episcopus plebi Dei, (Sixtus the bishop to the people of God) is an indication of that Pope's role in the construction. As well as this church on the summit of the Esquiline Hill, Pope Sixtus III is said to have commissioned extensive building projects throughout the city, which were continued by his successor Pope Leo I, the Great. The church retains the core of its original structure, despite several additional construction projects and damage by the earthquake of 1348. Church building in Rome in this period, as exemplified in Saint Mary Major, was inspired by the idea of Rome being not just the centre of the world of the Roman Empire, as it was seen in the classical period, but the centre of the Christian world. Santa Maria Maggiore, one of the first churches built in honour of the Virgin Mary, was erected in the immediate aftermath of the Council of Ephesus of 431, which proclaimed Mary Mother of God. Pope Sixtus III built it to commemorate this decision. Certainly, the atmosphere that generated the council gave rise also the mosaics that adorn the interior of the dedication: "whatever the precise connection was between council and church it is clear that the planners of the decoration belong to a period of concentrated debates on nature and status of the Virgin and incarnate Christ." The magnificent mosaics of the nave and triumphal arch, seen as "milestones in the depiction" of the Virgin, depict scenes of her life and that of Christ, but also scenes from the Old Testament: Moses striking the Red Sea, and Egyptians drowning in the Red Sea. Richard Krautheimer attributes the magnificence of the work also to the abundant revenue accruing to the papacy at the time from land holdings acquired by the Church during the 4th and 5th centuries on the Italian peninsula: "Some of these holdings were locally controlled; the majority as early as the end of the 5th century were administered directly from Rome with great efficiency: a central accounting system was involved in the papal chancery; and a budget was apparently prepared, one part of the income going to the papal administration, another to the needs of the clergy, a third to the maintenance of church buildings, a fourth to charity. These fines enabled the papacy to carry out through the 5th century an ambitious building program, including Santa Maria Maggiore." Miri Rubin believes that the building of the basilica was influenced also by seeing Mary as one who could represent the imperial ideals of classical Rome, bringing together the old Rome and the new Christian Rome: "In Rome, the city of martyrs, if no longer of emperors, Mary was a figure that could credibly carry imperial memories and representations." Gregory the Great may have been inspired by Byzantine devotions to the Theotokos (Mother of God) when after becoming Pope during a plague in 590 that had taken the life of his predecessor, he ordered for seven processions to march through the city of Rome chanting Psalms and Kyrie Eleison, in order to appease the wrath of God. The processions began in different parts of the city, but rather than finally converging on St Peter's, who was always the traditional protector of Rome, he instead ordered the processions to converge on Mary Major instead. When the popes returned to Rome after the period of the Avignon papacy, the buildings of the basilica became a temporary Palace of the Popes due to the deteriorated state of the Lateran Palace. The papal residence was later moved to the Palace of the Vatican in what is now Vatican City. The basilica was restored, redecorated and extended by various popes, including Eugene III (1145–1153), Nicholas IV (1288–92), Clement X (1670–76), and Benedict XIV (1740–58), who in the 1740s commissioned Ferdinando Fuga to build the present façade and to modify the interior. The interior of the Santa Maria Maggiore underwent a broad renovation encompassing all of its altars between the years 1575 and 1630. On 15 December 2015, a Palestinian and a Tunisian national were arrested after they tried to disarm soldiers stationed outside the basilica while yelling "Allah (God) is great". When police intervened, the two men aged 40 and 30 called other foreigners in the area to their aid, and assaulted and threatened the arresting officers. Piazza dell'Esquilino with the apse area of Santa Maria Maggiore. The original architecture of Santa Maria Maggiore was classical and traditionally Roman perhaps to convey the idea that Santa Maria Maggiore represented old imperial Rome as well as its Christian future. As one scholar puts it, "Santa Maria Maggiore so closely resembles a second-century imperial basilica that it has sometimes been thought to have been adapted from a basilica for use as a Christian church. Its plan was based on Hellenistic principles stated by Vitruvius at the time of Augustus." Even though Santa Maria Maggiore is immense in its area, it was built to plan. The design of the basilica was a typical one during this time in Rome: "a tall and wide nave; an aisle on either side; and a semicircular apse at the end of the nave." The key aspect that made Santa Maria Maggiore such a significant cornerstone in church building during the early 5th century were the beautiful mosaics found on the triumphal arch and nave. The Athenian marble columns supporting the nave are even older, and either come from the first basilica, or from another antique Roman building; thirty-six are marble and four granite, pared down, or shortened to make them identical by Ferdinando Fuga, who provided them with identical gilt-bronze capitals. The 14th century campanile, or bell tower, is the highest in Rome, at 246 feet, (about 75 m.). The basilica's 16th-century coffered ceiling, to a design by Giuliano da Sangallo, is said to be gilded with gold, initially brought by Christopher Columbus, presented by Ferdinand and Isabella to the Spanish pope, Alexander VI. The apse mosaic, the Coronation of the Virgin, is from 1295, signed by the Franciscan friar, Jacopo Torriti. The Basilica also contains frescoes by Giovanni Baglione, in the Cappella Borghese. The 12th-century façade has been masked by a reconstruction, with a screening loggia, that were added by Pope Benedict XIV in 1743, to designs by Ferdinando Fuga that did not damage the mosaics of the façade. The wing of the canonica (sacristy) to its left and a matching wing to the right (designed by Flaminio Ponzio) give the basilica's front the aspect of a palace facing the Piazza Santa Maria Maggiore. To the right of the Basilica's façade is a memorial representing a column in the form of an up-ended cannon barrel topped with a cross: it was erected by Pope Clement VIII to celebrate the end of the French Wars of Religion. The Marian column erected in 1614, to designs of Carlo Maderno is the model for numerous Marian columns erected in Catholic countries in thanksgiving for remission of the plague during the Baroque era. (An example is the Holy Trinity Column in Olomouc, the Czech Republic). The column itself is the sole remainder from Constantine's Basilica of Maxentius and Constantine in Campo Vaccino Rome Art Lover website notes that Campo Vaccino as what the Roman Forum was called until the 18th century. Maderno's fountain at the base combines the armorial eagles and dragons of Paul V.
The mosaics found in Santa Maria Maggiore are one of the oldest representations of the Virgin Mary in Christian Late Antiquity. As one scholar puts it, "This is well demonstrated by the decoration of Santa Maria Maggiore in Rome,... where the iconographic depiction of the Virgin Mary was chosen at least in part to celebrate the affirmation of Mary as Theotokos (bearer of God) by the third ecumenical Council of Ephesus in 431 CE." The mosaics of the triumphal arch and the nave in Santa Maria Maggiore gave a model for the future representations of the Virgin Mary. The influences of these mosaics are rooted in late antique impressionism that could be seen in frescoes, manuscript paintings and many pavement mosaics across villas in Africa, Syria and Sicily during the 5th century. These mosaics gave historians insight into artistic, religious, and social movements during this time. As Margaret Miles explains the mosaics in Santa Maria Maggiore have two goals: one to glorify the Virgin Mary as Theotokos (God-Bearer); and the other to present "a systematic and comprehensive articulation of the relationship of the Hebrew Bible and the Christian scriptures as one in which the Hebrew Bible foreshadows Christianity." This is explained by the dual images of Old Testament and New Testament events depicted in the mosaics of the triumphal arch and the nave. The mosaics also show the range of artistic expertise and refute the theory that mosaic technique during the time was based on copying from model books. The mosaics found in Santa Maria Maggiore are combinations of different styles of mosaic art during the time, according to art scholar Robin Cormack: "the range of artistic expertise and the actual complexities of production can hardly be reduced to a mentality of copying. A test case is given by the mosaics of S. Maria Maggiore in Rome". The triumphal arch at the head of the nave was at first referred to as the apse arch, but later became known as the triumphal arch. The triumphal arch is illustrated with magnificent mosaics depicting different scenes of Christ and the Virgin Mary. There was a difference in the styles used in the triumphal arch mosaics compared to those of the nave; the style of the triumphal arch was much more linear and flat as one scholar describes it, not nearly as much action, emotion and movement in them as there were in the Old Testament mosaics of the nave. One of the first scenes that were visible on the triumphal arch was a panel of Christ's enthronement with a group of angels as his court. As one historian describes it: "On the apse arch Christ is enthroned, a young emperor attended by four chamberlains, angels of course", this is a perfect example of mosaic art in the 5th century. Another panel found on the triumphal arch is of the Virgin, she is crowned and dressed in a colorful veil, her wardrobe subtly brings to mind that of a Roman empress and in this panel she has her divine son walking with her and a suite of angels and Joseph ready to greet her; "The Virgin...shows to perfection the impressionistic character of mosaics." Another panel is known as the Adoration of the Magi and this mosaic depicts Infant Christ and The Virgin and the arrival of the three wise men, "mosaics illustrating Christ's first coming and his youth covered the triumphal arch." The other panel depicts the Virgin accompanied by five martyrs. The nave of the basilica was covered in mosaics representing Old Testament events of Moses leading the Jews out of Egypt across the Red Sea. 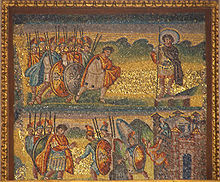 "The nave mosaics (which represents stories of Old Testament history and accordingly offered Christians in Rome a new 'past') are illusionistic in a colorful and impressionist manner" as this scholar puts it the scene was filled with movement, emotion, and it was to inspire thinking of Rome's "new" past; the past of the Old Testament. As one scholar describes it: "Moses strikes the waters of the Red Sea in a heroic gesture, his toga in light and dark grays and blues, but lined in black, the folds white lines, the tunic underneath light blue; the man next to him wears a deep blue toga over a gray and white tunic." Another panel shows the demise of the Egyptians in the Red Sea. An observer describes the mosaic: "The Egyptians, clad in blue armor with gold bands and scarlet cloaks wildly flying, drown in the greenish blue waters; the horses, white or light brown shaded with darker browns, highlighted in white, the accoutrements a bright red." Under the high altar of the basilica is the Crypt of the Nativity or Bethlehem Crypt, with a crystal reliquary designed by Giuseppe Valadier said to contain wood from the Holy Crib of the nativity of Jesus Christ. Here is the burial place of Saint Jerome, the 4th-century Doctor of the Church who translated the Bible into the Latin language (the Vulgate). Fragments of the sculpture of the Nativity believed to be by 13th-century Arnolfo di Cambio were transferred to beneath the altar of the large Sistine Chapel off the right transept of the church. This chapel of the Blessed Sacrament is named after Pope Sixtus V, and is not to be confused with the Sistine Chapel of the Vatican, named after Pope Sixtus IV. The architect Domenico Fontana designed the chapel, which contains the tombs of Sixtus V himself and of his early patron Pope Pius V. The main altar in the chapel has four gilded bronze angels by Sebastiano Torregiani, holding up the ciborium, which is a model of the chapel itself. Beneath this altar is the Oratory or Chapel of the Nativity, on whose altar, at that time situated in the Crypt of the Nativity below the main altar of the church itself, Saint Ignatius of Loyola celebrated his first Mass as a priest on 25 December 1538. Just outside the Sistine Chapel is the tomb of Gianlorenzo Bernini and his family. The Mannerist interior decoration of the Sistine Chapel was completed (1587–1589) by a large team of artists, directed by Cesare Nebbia and Giovanni Guerra. While the art biographer, Giovanni Baglione allocates specific works to individual artists, recent scholarship finds that the hand of Nebbia drew preliminary sketches for many, if not all, of the frescoes. Baglione also concedes the roles of Nebbia and Guerra could be summarized as "Nebbia drew, and Guerra supervised the teams". The column in the Piazza Santa Maria Maggiore celebrates the famous icon of the Virgin Mary now enshrined in the Borghese Chapel of the basilica. It is known as Salus Populi Romani, or Health of the Roman People or Salvation of the Roman People, due to a miracle in which the icon reportedly helped keep plague from the city. The icon is at least a thousand years old, and according to a tradition was painted from life by St Luke the Evangelist using the wooden table of the Holy Family in Nazareth. Salus Populi Romani, perhaps the oldest Marian image in Rome. The Salus Populi Romani has been a favourite of several popes and acted as a key Mariological symbol. Roman-born Pope Pius XII (Eugenio Pacelli) celebrated his first Holy Mass there on 1 April 1899. In 1953, the icon was carried through Rome to initiate the first Marian year in church history. In 1954, the icon was crowned by Pope Pius XII as he introduced a new Marian feast Queenship of Mary. Pope Paul VI, Pope John Paul II, Pope Benedict XVI, and Pope Francis all honoured the Salus Populi Romani with personal visits and liturgical celebrations. As a papal basilica, Santa Maria Maggiore is often used by the pope. He presides over the rites for the annual Feast of the Assumption of Mary on 15 August there. Except for a few priests and the basilica's archpriest, the canopied high altar is reserved for use by the pope alone. Pope Francis visited the basilica on the day after his election. The pope gives charge of the basilica to an archpriest, usually a cardinal. Formerly, the archpriest was the titular Latin Patriarch of Antioch, a title abolished in 1964. Since 29 December 2016, the archpriest has been Stanisław Ryłko. In addition to the archpriest and his assistant priests, a chapter of canons is resident. Redemptorist and Dominican priests serve the church. The King of Spain, currently Felipe VI, is ex officio protocanon of the basilica's chapter. Funerary monument of Clement IX (1671) by Carlo Rainaldi with the papal bust by Domenico Guidi. Statue of Pius IX in prayer by Ignazio Jacometti, (c. 1880). ^ This triptych painted around 1423 was commissioned for the basilica by a member of the Colonna family; it is now in the Museo di Capodimonte, Naples (Paul Joannides, "The Colonna Triptych by Masolino and Masaccio," Arte Cristiana no 728 (1988:339-)). The miracle is depicted as witnessed by a crowd of men and women, with Jesus and the Virgin Mary observing from above. ^ When Pope Benedict XVI abandoned the title "Patriarch of the West", the title of St. Mary Major changed from patriarchal to papal basilica, as on its official website. ^ Cardinal Pietro Capocci (died 1259) is mentioned in the majority of the catalogs of archpriests of Liberian Basilica but the documents from the archive of the Basilica, published by Ferri in ASRSP, vol. 27, p. 34–39 and vol. 30, p. 119, give no support for this affirmation. Document dated 19 March 1244 mentions Astor (or Aston) as archpriest, documents between 13 February 1247 and 1 October 1255 mention archpriest without mentioning his name but also without indicating his cardinalate, and on 28 May 1258 Romano was archpriest of the Basilica; the latest document mentions also cardinal Pietro Capocci but makes no reference to his occupation of that post. If he was really an archpriest under Innocent IV, he must have later resigned, but it seems more likely that this statement resulted from a confusion. 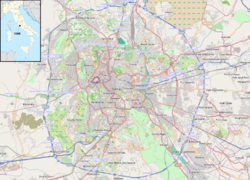 ^ "Historic Centre of Rome, the Properties of the Holy See in that City Enjoying Extraterritorial Rights and San Paolo Fuori le Mura". Whc.unesco.org. Archived from the original on 29 June 2011. Retrieved 17 June 2011. ^ The actual, official name seems to vary: the Holy See's press office uses "Papal Liberian Basilica of St. Mary Major in Rome" in English in a 2011 note Archived 3 March 2013 at the Wayback Machine, while the official Vatican site for the Basilica uses various formulas not including "Liberian" or Liberiana, some under a coat of arms that includes "basilica Liberiana" in Italian. ^ a b Pius Parsch, The Church's Year of Grace quoted in Catholic Culture: "Ordinary Time, 5 August"
^ See for example the Holy See's press office using "Papal Liberian Basilica of St. Mary Major in Rome" in English in a 2011 note Archived 3 March 2013 at the Wayback Machine, while the official Vatican website for the church uses various formulas, some under a coat of arms that includes "basilica Liberiana" in Italian. Herbermann, Charles, ed. (1913). "Patriarch and Patriarchate" . Catholic Encyclopedia. New York: Robert Appleton Company. ^ Panvinio, Onofrio (1570). Le sette chiese romane. Rome. Retrieved 12 August 2011. ^ Sacchi, Guido. "La visita alle Sette Chiese: cenni storici" (in Italian). Retrieved 12 August 2011. ^ Charles A. Coulombe, Vicars of Christ, p. 330. ^ Basilica memorial to celebrate the end of the French Wars of Religion; accessed 22 March 2014. ^ Davies, Lizzy (14 March 2013). "Pope Francis eschews trappings of papacy on first day in office". The Guardian. Retrieved 28 December 2016. Holy See (1969). Calendarium Romanum: ex decreto Sacrosancti Oecumenici Concilii Vaticani II instauratum. Vatican State: Typis Polyglottis Vaticanis. Beny, Roloff; Gunn, Peter (1981). The churches of Rome. New York: Simon and Schuster. ISBN 978-0-671-43447-2. Cormack, Robin (2000). "Chapter 30: The Visual Arts". In Cameron, Averil; Ward-Perkins, Bryan; Whitby, Michael (eds.). The Cambridge ancient history. empire and successors, AD 425–600. XIV. Cambridge: Cambridge University Press. ISBN 978-0-521-32591-2. Eitel-Porter, Rhoda (1997). "Artistic Co-Operation in Late Sixteenth-Century Rome: Sistine Chapel in S. Maria Maggiore and the Scala Santa". The Burlington Magazine. 139 (1139): 452–462. JSTOR 887503. Ferri, G. (1904). Le carte dell'Archivio Liberiano dal secolo X al XV. Archivio della Società Romana di Storia Patria (in Italian). 27. Ferri, G. (1905). Le carte dell'Archivio Liberiano dal secolo X al XV (continua). Archivio della Società Romana di Storia Patria (in Italian). 28. Ferri, G. (1907). Le carte dell'Archivio Liberiano dal secolo X al XV (continuazione e fine). Archivio della Società Romana di Storia Patria (in Italian). 30. Gwynn, David M.; Bangert, Susanne (2010). Religious diversity in late antiquity. Leiden: Brill. ISBN 978-90-04-18000-0. Krautheimer, Richard (1980). Rome : profile of a city, 312–1308. Princeton, N.J.: Princeton University Press. ISBN 978-0-691-00319-1. Loomis, Louise Ropes (1916). The Book of Popes (Liber Pontificalis). New York: Columbia University Press. OCLC 1941708. Miles, Margaret R. (1993). "Santa Maria Maggiore's Fifth-Century Mosaics: Triumphal Christianity and the Jews". Harvard Theological Review. 86 (2): 155–172. doi:10.1017/S001781600003114X. The fifth-century mosaics of Santa Maria Maggiore in Rome represent the oldest surviving program of mosaic decoration in a Christian church. Moroni, Gaetano (1840). "Notizie sul capitolo ed arcipreti della basilica di s. Maria Maggiore". Dizionario di erudizione storico-ecclesiastica da S. Pietro sino ai nostri giorni (in Italian). 12. Tipografia Emiliana. pp. 127–135. Retrieved 4 August 2011. Ott, Michael (1913). "Our Lady of the Snow" . In Herbermann, Charles (ed.). Catholic Encyclopedia. New York: Robert Appleton Company. Retrieved 2008-12-17. Rubin, Miri (2009). Mother of God : a history of the Virgin Mary. New Haven: Yale University Press. ISBN 978-0-300-10500-1. Vassilaki, Maria (2000). The mother of God : representations of the Virgin in Byzantine art. Milano: Skira. ISBN 88-8118-738-8. Warland, Rainer (2003). "The Concept of Rome in Late Antiquity reflected in the mosaics of the Triumphal Arch of S. Maria Maggiore in Rome" (PDF). Acta ad archaeologiam et artium historiam pertinentia. 17: 127–141. ISSN 0333-1512. Retrieved 4 August 2011. Wikimedia Commons has media related to Santa Maria Maggiore (Rome). Wikisource has the text of the 1913 Catholic Encyclopedia article Our Lady of the Snow. "Santa Maria Maggiore" . New International Encyclopedia. 1905.